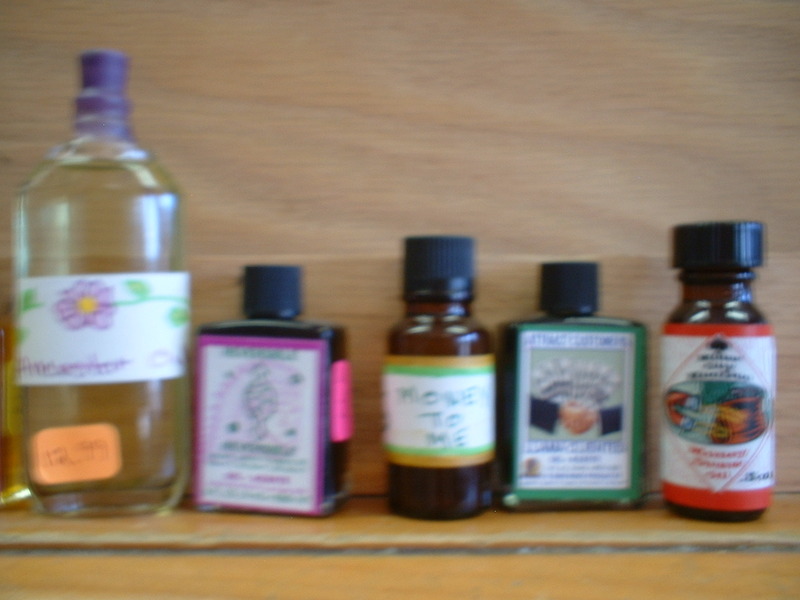 A selection of the oils we will be learning to use in this class. 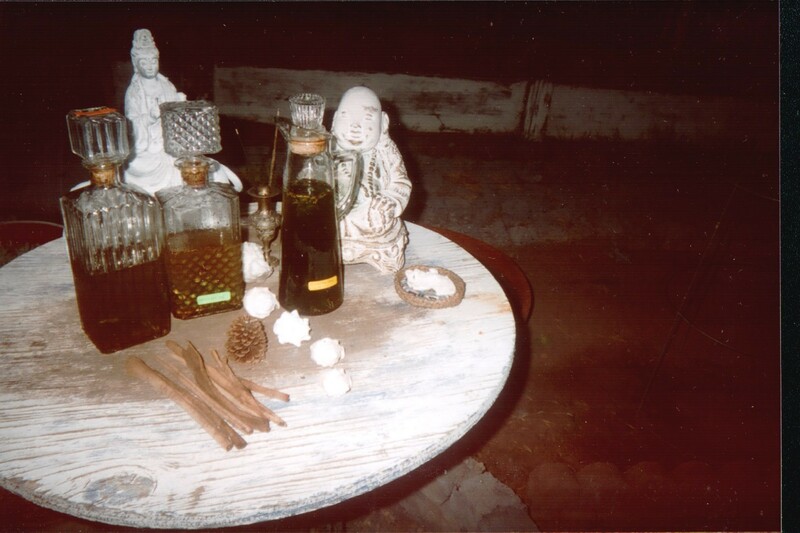 Oils 'cooking' on garden altar under full moon. Today we have just finished bottling the newest oils, a very satisfying process. I really like seeing the just-filled bottles lined up neatly in rows, ready set to work at their appointed tasks. These oils have been ‘cooking’ for awhile, some outside on the garden altar using the phases of the moon for timing, under the full moon (or a waning or waxing moon depending on the oils designated purpose), others were placed under full sun (which we in the southwest have in abundance! ), all created with the best available olive and sunflower oils and herbs grown in our garden or purchased from a good organic grower. As you know, we grow in our own garden many of the herbs and spices that we use, the ones that we can’t grow here are purchased from growers who use only organic processes so that no contaminates are introduced into the oils and incense blends, making them safe to burn inside your house and to use on your skin. 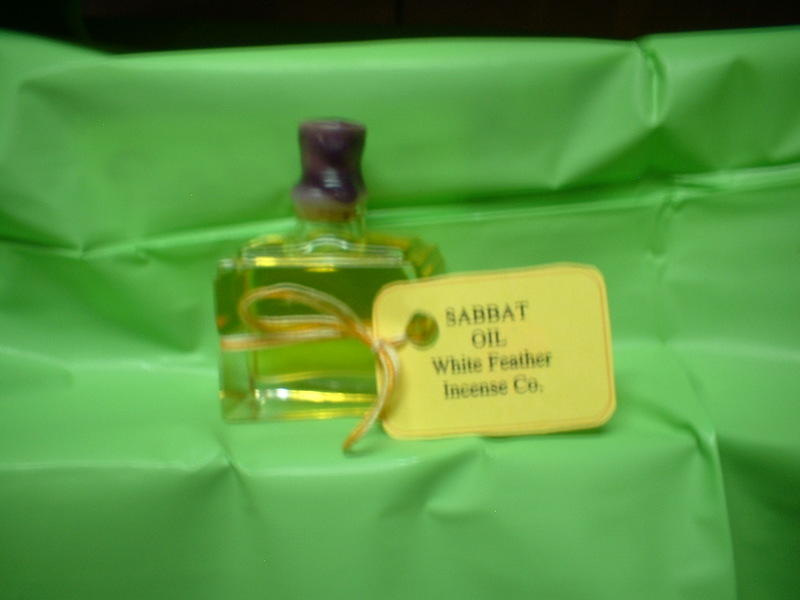 * The second oil, available in a larger size bottle, also corked and waxed is”Ancestor Oil” for use when calling up your ancestors to help with situations or to venerate those who have passed, physical or spiritual ancestors. $12.99 Use on candles, in oil burners, on skin, or on any ritual tool. All of these oils have been made with the appropriate oils, herbs and spices to correspond to the condition you need to work upon, and will bring results to surprise you! Today I am finally getting around to preparing for the next series of classes to be held in the Funky Karma Magicshop. The most requested class is “Oils, what are they and how to use them in Conjour and Ritual Magic.” These will be held in September. If you are interested please let me know what days and hours are good for you. I would like to plan the classes so the most people can take advantage of this learning experience. This class cost will be $12.00 and include 2 free oils. The 2nd most requested class is always “Candle Magic”, to be held in October. Cost is $15.oo and includes one candle. I am planning to begin a new class series: “Making and using a Honey Jar”, “Freezer Spells”, “Vinegar Jars and Ammonia Jars.” This will probably be a 2 day class, cost will be $20.00 and will include materials to create 2 projects. Again please let me know days and times and I will try to accommodate everyone’s preference. Class size will be limited and pre-registration is required. Call the shop at 575-993-9797 for info and registration. Pluma has learned quite a bit this summer… maybe the lesson is “Look before you Leap”…”Be careful what you ask for:… “Think things through before starting” or maybe “Be very specific when you ask for something”… Anyway I’ll let him tell it in his own Meows. Hi everyone, I’m PlumaBlanca, the Working Cat. When I am not hard at work in the MagickShop I like to sit in the front window at home watching the children from across the street playing with their toys outside on their front yard. They have such fun, running fast, jumping up, throwing a ball, waving their arms excitedly, and I really want to go outside and play with them… But I am not allowed out…they say it is because I can’t hear and wouldn’t know if “danger” was headed toward me, (what ever that might be?). I don’t think there is anything ‘dangerous’ out there, the children do just fine after all! It’s not fair, everyone gets to have fun but me. So I sit on the windowsill, wiggling my tail, anticipating the catch and watching and wanting to play. Sometimes there are children who play with me in the MagickShop, and OH! I love that, we run around the big incense table in the Front Incense Room, then chase each other down the hallway, past the Magick Room into the Tea Room and thru the curtain to the Kitchen. We have a blast! But the children always have to leave just as we are having the most fun, How I wish they could stay all day and I really, really wish they would come home with me so we could play all the time. I’d so like to have a child all of my own who would play with me everyday. One day in June, we didn’t go to work, instead I had to stay home alone all day, not my favorite thing to do, in fact I hate staying alone. I can still remember when I was a kitten, being thrown out of a car, alone, somewhere by the big river, no Mama Cat with milk, no food, scared and hungry, then I got sick and almost died. Used up at least one of my lives out there, before I was rescued. Now I have a good home with lots of food and love, and they very seldom leave me home alone. That’s why I am a working cat, so I don’t have to be home alone. But that day they broke the rules. They left me home alone. By myself! I sat in the front hall until I got tired of crying big Meows then hid behind the couch, tried to sleep and waited to see if they would ever come back. They were gone a very, very, very long time! Finally, after hours and hours someone touched me on my head, I jumped up, scared, someone had found my home alone hiding spot! Something might get me, what should I do? But it was my Lady, she did come back!! Meow, Meow, kisses and hugs! She showed me someone was with her, a child, Janie. They had been to the airport to pick her up. Wow, I have someone to play with, we can play all the time! Hurrah! I showed her all my toys, this is great, we played fetch all evening. At bed time she went into the other room, the one I don’t get to go into very often because the door is always shut, and got onto the bed. I jumped up too, this is great! We can play all night! Soon we fell asleep, to dream happy playing dreams. The next day Janie went to work with us, now I was very happy, we could play all day! We began a fast game of chase until my Auntie Jill came in, she always plays with me. I thought we could play a three way ball game. But today, after a quick pat on the head she wanted to play with my new child friend and they both ignored me. Oh well I found a cozy spot and took a nap. That night at home after work I watched out the window for a few minutes, but was too excited to stay there, I had my own friend now, I could play all the time. My new friend sat on the couch between my Lady and Man, in my spot, where I always take a nap and get pettings while they watch TV. I climbed up too but didn’t have as much room as usual, children take up a lot of room on a couch. Again Janie went into the other room to sleep, I spent part of the night in bed with her but got lonely for my Lady and went across the hall to her bed where I usually sleep, cuddled up close, laid my head on the pillow and went to sleep. But my slumber didn’t last long. The child had a bad dream and wanted to get into the bed with my Lady and me!! There wasn’t room for us all, I ended up on the floor. That evening after work, (another dissappointing day where all the customers paid more attention to the child than me,) several more people came to the house, they had suitcases and bags and stuff and they acted like they were moving in. Putting stuff everyware, some of them slept on the couch in the living room, another one on the couch in the family room, my Man was in the bed with my Lady, the child was in the other room with the door shut. I sat in the hallway and meowed, feeling sad. No one remembered I had to sleep too. No one loved me. In the morning there were too many people trying to eat breakfast, my tail got stepped on, I couldn’t sit on my regular chair because someone was in it so when the door got opened and not shut quickly I saw my chance and ran out. At last! I could run fast, climb the tree, jump over the fence, run some more, chase a bird, fly over another fence. I ran until I was panting. Rested a moment then ran some more. When I finally stopped running, I decided to go inside and get a drink of water and some breakfast. I turned around but didn’t see my house. Where was I? I meowed for someone to come get me but no one did. ” Oh” I remembered, ” I climbed over a fence” so I jumped back over the wall expecting to see my house but didn’t. There were 2 little tiny dogs in that yard, they ran at me with their mouths open, did they want to eat me? Maybe I went over 2 fences I thought, so I climbed a tree and went into another yard. It wasn’t mine and a big dog chased me over another fence and that yard wasn’t mine either. Now I was scared. I meowed as loud as I could. ‘Lady, please come and find me’. I jumped up on the rock wall and began running, I went one way then turned around and ran the other way. After a long time of blindly running my Lady grabbed me as I ran along the wall. She hugged me and carried me inside. It took me along time to calm down, I had to sit in her lap for an hour while she patted me, washed my face and paws and Janie kissed and patted me. “Poor Pluma,” she was crying, “he is terrified!” And I was. Being alone outside is so scary. It’s like being lost! I don’t want to ever go outside again, that is, unless I am in my carry case on my way to work where all the customers play with me and I am safe. After I calmed down we all went to work. I learned later that many of my friends had been out looking for me while I was lost: that day several came into the shop to give me a pat and a play. They were all glad that I found my way home and urged me never to start running like that again. I did learn something that day! Janie stayed with us for another 3 weeks, she played with me often but just as often she played with the people who came into the shop. I was dissapointed that she wasn’t just my friend but as Isaac Asimov said in Foundation “it was childish to feel disappointed, but childishness comes almost as naturally to a cat as it does to a child” Well he really said ‘to a man’ but I am sure he meant ‘to a cat’ In the evenings she played with my people, sometimes they all went out in the car somewhere and I had to stay home alone. I thought that having my own child to play with me would be fun, sometimes it was not. She sat in my spot on the couch, they hugged and kissed her, instead of me. I think they love her more than me. One night she and my Lady got up in the bed and read books together, there wasn’t room for me so I knocked all the books and magazines on the floor. That got me in trouble. I sat in the hallway and tried to scare Janie with my most mean looks and once I scratched her. That got me in trouble too. I was really jealouse of her, I think they like her better than me. I started hidding under the bed, let them miss me I thought, then they will come looking for me. I fell asleep before that happened. Then one day she kissed me good-bye, took all her stuff and went back to the airport. I haven’t seen her since. Slowly things returned to normal; we go to work. I play with whoever comes into the shop, in the evening we sit on the couch , I get my favorite spot and all the pats and plays that I want. I miss her but am glad to be an only cat again. I still watch the children outside, and my tail twitches, but I like my house and want to stay inside, protected and loved.